In this short workshop you will learn how to map the tracking ecology related to a set of websites using the DMI Tracker Tracker tool and Gephi. The Tracker Tracker tool was conceived at the Digital Methods Winterschool 2012 in January. It is build on top of the anti-tracking plugin www.ghostery.com and allows to identify the invisible web, devices that track user activities online and the services associated to them. In order to prepare for this workshop we recommend reading the related projects and materials listed below. Please download and install Gephi at https://gephi.org/ before the workshop starts so you can also learn how to visualize your results. Marketers are spying on Internet users -- observing and remembering people's clicks, and building and selling detailed dossiers of their activities and interests. The Wall Street Journal's What They Know series documents the new, cutting-edge uses of this Internet-tracking technology. The Journal analyzed the tracking files installed on people's computers by the 50 most popular U.S. websites, plus WSJ.com. The Journal also built an "exposure index" -- to determine the degree to which each site exposes visitors to monitoring -- by studying the tracking technologies they install and the privacy policies that guide their use. Surfing the Web kickstarts a process that passes information about you and your interests to tracking companies and advertisers. See how it works. To determine the prevalence of Internet tracking technologies, The Wall Street Journal analyzed the 50 most-visited U.S. websites, as ranked by the comScore Media Metrix report from October 2009. Speaker: Brian Kennish Founder of Disconnect. What companies and organizations are collecting our web-browsing activity? How complete is their data? Do they have personally-identifiable information? What do they do with the data? What exactly are web cookies and what do they do? This guide gives you an introduction to help you understand more about our Tracking the Trackers project. The red circles are the top ten most prolific tracking companies found in our Tracking the Trackers data. Click on their names to discover more about them. The blue circles are the 100 most popular websites that use them. Guardian readers helped to collect information on more than 7,000 websites and the services they use that employ tracking. Background on Third-Party Web Tracking and Anonymity by The Center for Internet and Society at Stanford Law School, a leader in the study of the law and policy around the Internet and other emerging technologies. To capture on-line behavior, thousands of HTTP cookies are sent daily to web browsers to identify users and gather statistical knowledge about tastes and habits. The cookie consensus website hosts a collection of cookies that Andrea Fiore received while surfing through the first 50 entries of the Alexa directory of News sites. In the future it will also host a software that will give the users the capability to create their own cookie collections. TRACK-THE-TRACKERS---” is a network installation consisting of tactical media components. The work makes use of existing personal technologies in conjunction with the satellite GPS infrastructure to provide participants with an expanded audible (not a visual) experience of the proliferation of video surveillance in the urban public sphere. The internet platform http://www.t-t-trackers.net serves as an exchange point for these coordinates: the data gathered in this way is made available to the other participants by uploading it to the internet platform. The project prompts participants to think beyond the protection of their own private sphere and to invest in the public sphere. This page will tell you what websites you have recently visited! In other words, it will partially access your browser's history without your permission. This implies that any website on the Internet can do this. I got the inspiration from Michal's code after reading about it on HN. Is your browser configuration rare or unique? If so, web sites may be able to track you, even if you limit or disable cookies. Panopticlick tests your browser to see how unique it is based on the information it will share with sites it visits. Click below and you will be given a uniqueness score, letting you see how easily identifiable you might be as you surf the web. Zur Benutzung der Cookie-Suche geben Sie einfach eine Webadresse (URL) in das Eingabefeld ein. Die Cookiesuchmaschine besucht die angegebene Adresse und versucht auszuwerten, welche Cookies beim Besuch gesetzt werden. Die Auswertung der eingegebenen Adresse kann mehrere Sekunden dauern. Die Darstellung der Ergebnisse erfolgt zweigeteilt in sogenannte Erstanbieter-Cookies und Drittanbieter-Cookies. FourthParty is an open-source platform for measuring dynamic web content. Mayer, Jonathan R., and John C. Mitchell. 2012. “Third-party Web Tracking: Policy and Technology.” In Security and Privacy (SP), 2012 IEEE Symposium On, 413–427. http://ieeexplore.ieee.org/xpls/abs_all.jsp?arnumber=6234427. The newly developed tool also allows us to create connections among websites, defining relations based on their connection to the same tracking devices, giving insight into the fluidity of content. In short, by repurposing the Ghostery tool we are able to characterize different collections of URLs. We are further interested to study tracking ecologies in a number of URL collections, issue spaces or web spheres, to see if there are specific trackers at work in particular countries, whether data-protective countries or web spheres deploy less tracking devices and whether countries like Iran use trackers from major US corporations. On top of that we are interested in which trackers are at work in the news sphere, in specific issue spaces, such as health/addiction sites, adults' and childrens' sites, privacy-concerned sites and technology blogs. On March 9, Carolin Gerlitz and I presented our paper Reworking the fabric of the web: The Like economy at the Unlike Us conference in Amsterdam. We showed the outcome of some empirical work, building on a previous Winterschool project with the Digital Methods Initiative called Track the Trackers. 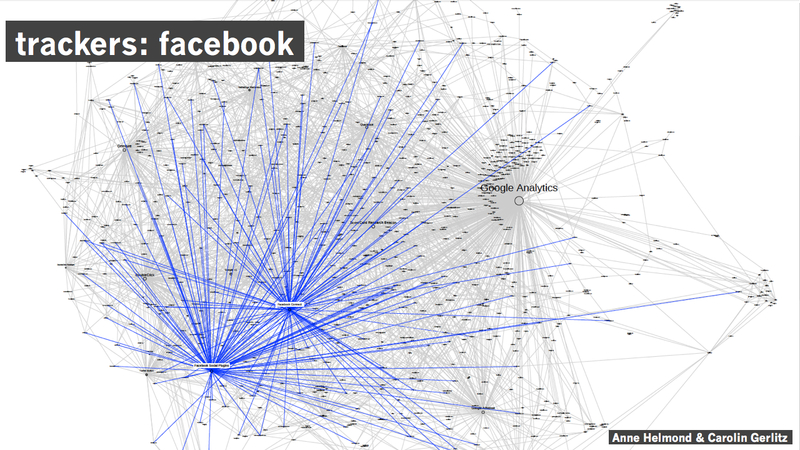 For Unlike Us we visualized the relative presence of Facebook trackers in the top 1000 Alexa as a way to make visible the alternative fabric of the web Facebook is creating. More information about the tool and method to create these maps can be found on the Tracker Tracker tool wiki page. 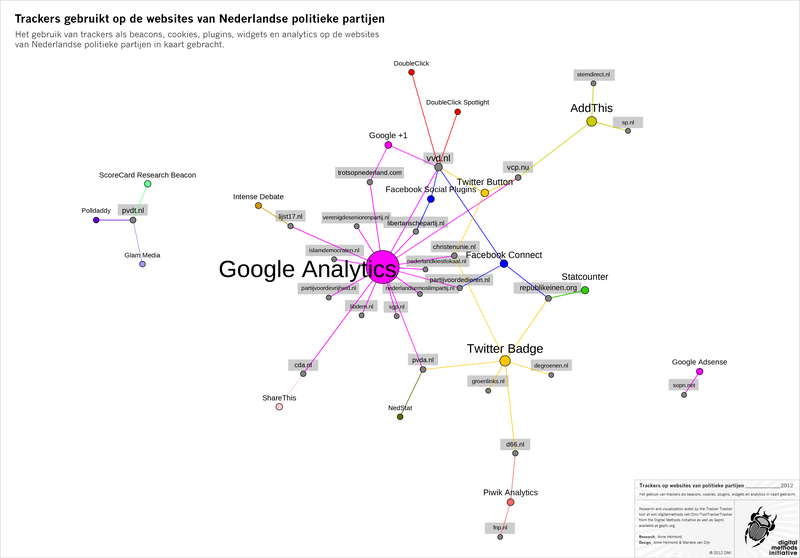 Trackers on Dutch political websites by Anne Helmond. Het gebruik van trackers als beacons, cookies, plugins, widgets en analytics op de websites van Nederlandse politieke partijen in kaart gebracht. Collect a set of sources or choose from these predefined URL lists. Settings for frontpage only: only look at specified pages. In Data Laboratory: Create a boolean column from regex match > Label. Anne Helmond (NL) and Carolin Gerlitz (UK) - Reworking the fabric of the web: The Like economy from network cultures on Vimeo.